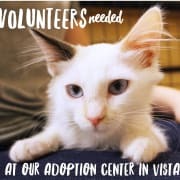 LYFF Cat Rescue, a 501(c)(3) registered charity, is looking for volunteers to help out at the PetSmart Cattery in Vista! Interested in spending a few hours each week volunteering and playing with adorable cats and kittens at our Cattery? Look no further! *if you're interested in volunteering but these times do not work for you, please email us and let us know when you are available! -Interact and play with the cats! -Able to commit 2+ hours a week to the kitties! -Have a passion for saving lives!